An aerial photograph a year or so prior to the construction. 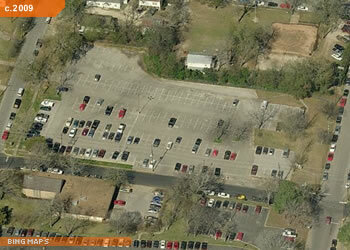 Campus property north of 16th Street had been regualted to parking lots for decades. The northern side of the new dorm. 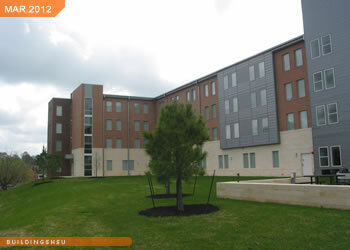 Lone Star Hall is a dormitory on the north-side of campus along Bearkat Boulevard. It opened for residency in August 2011. The $18 Million facility was first discussed in the 2008 Campus Master Plan as one of two proposed residence halls . It will house 298 students of all classifications (freshmen and above). The Residence Life administration offices are located on the ground floor of the building, having moved from elsewhere from campus. 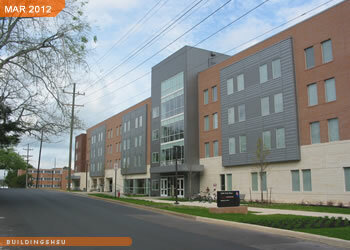 A December 2010 Houstonian article revealed the name "Lone Star Hall" had been decided by students participating in a campus-wide online vote (in November) that included four prospective names , a process similar to the naming of Raven Village.